We’ve had the goslings a few days now. Just to recap, we originally bought four at Big R. We were led astray by the person “helping” us, so we picked lighter colored goslings. We were told that the darker ones were Africans, not Embdens. It turns out the lighter vs. darker is a way (not foolproof) to determine gender. Most likely we bought all boys at first. 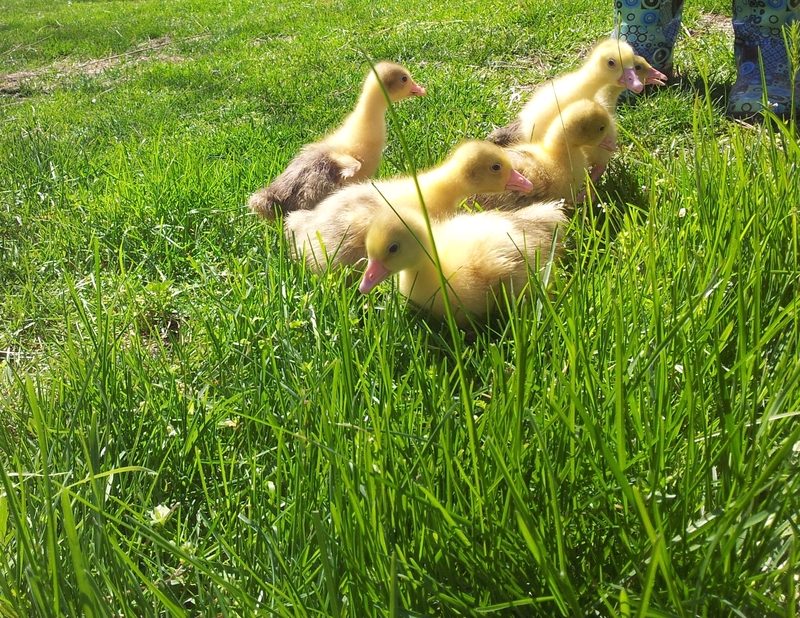 The wife went back and bought two more goslings. These ones are a bit darker. Here’s a pic of them being cute. The goslings are talkers, but not annoying, at least for right now. They stick together and are really good about following us around. The goslings’ main source of entertainment is ducking (goosing?) their heads in their water dish. This makes for wet goslings after a while. We’re feeding them crumbles. They also like dandelions and a few other broad leaved plants. Last night, the wife and I completed a bigger enclosure for them. It should last 2 or 3 weeks. At that point, they’ll go out to the stead and meet the chicks.